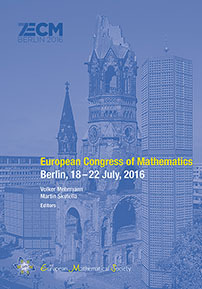 The European Congress of Mathematics, held every four years, is a well-established major international mathematical event. Following those in Paris (1992), Budapest (1996), Barcelona (2000), Stockholm (2004), Amsterdam (2008), and Kraków (2012), the Seventh European Congress of Mathematics (7ECM) took place in Berlin, Germany, July 18–22, 2016, with about 1100 participants from all over the world. Ten plenary, thirty-three invited, and four special lectures formed the core of the program. As at all the previous EMS congresses, ten outstanding young mathematicians received the EMS prizes in recognition of their research achievements. In addition, two more prizes were awarded: The Felix Klein Prize for a remarkable solution of an industrial problem, and—for the second time—the Otto Neugebauer Prize for a highly original and influential piece of work in the history of mathematics. The program was complemented by forty-three minisymposia with about 160 talks as well as contributed talks that ranged over all areas of mathematics. Several panel discussions and meetings were organized, covering a variety of issues ranging from the future of mathematical publishing to public awareness of mathematics. These proceedings present extended versions of most of the plenary and invited lectures delivered during the congress, providing a permanent record of the best of what mathematics offers today. Graduate students and research mathematicians interested in the lectures discussed at the 2016 European Congress of Mathematicians (7ECM).